Carmela Delgado was born in Paris in 1991. At 8 years of age she took her first bandoneon lesson at the Gennevilliers Conservatoire. She began her studies at 12 years of age with Juan-Jose Mosalini, one of the most internationally renowned bandoneonists. Nuestro Tiempo Trio at the Espace Kiron and at the Triton (Paris). Carmela soon began working in theatre and has worked with numerous ensembles (2009 «Śourous at the théâtre de la Tempête, 2010 in Baden-Switzerland with the actor Palino, 2012 with the company Alacompote in Noces de sang by Garcia Lorca,2012-2013 with Hélène Bohy in Tangonino). Carmela recorded the Album “Soleado” with her father Manuel Delgado (Flamenco guitarist) and toured with him in Germany, France and Spain. She is also a founding member of the Cuarteto Lunares (violin, cello, contrabass, bandoneon) with Aurélie Gallois and Gersende Perini. She frequently performs with this Quartet for new tango and recorded her first album with them in 2015. Anne Le Pape has performed with the Grand Orchestre de Tango of Juan Jose Mossalini since its founding in 1992. After finishing her studies at the CNSM in Lyon (majoring in chamber music), she was accepted into the ProQuartet Institute for chamber music where she studied with the Alban Berg-, Hagen- and Lasalle-Quartets. 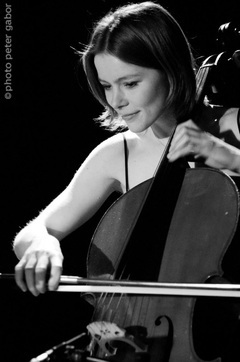 She has won several prizes performing with trios and quartets in international competitions. 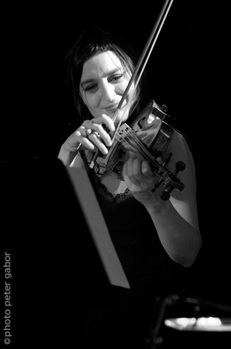 She is the lead violinist of the tango sextet Las Malenas, as well as the modern tango orchestra Fleurs noires, with whom she plays in France and abroad. 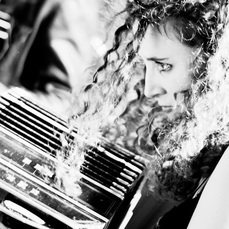 Since 2011 she has played with the Paris based ensemble Melingo (Café de la Danse, La Cigale, festival Banlieues Bleues, Trianon...) as well as with TAXII tango XXI under Pablo Gignoli. Her musical journey then lead her to Jazz music and through this she recorded the album DPZ (with De Pourquery/ Zimmermann), and performed in a project of music by King Krimson, A la recherche du Roi Frippé by Médéric Collignon. The recorded album was voted ‘Best album of the year’ at the Victoires du Jazz in 2013. 2015. In the same year, she recored the work Orchestrales with Elise Caron and the ensemble "Las Malenas” ( arrangements by Denis Chouillet, Michel Musseau, Andy Emler, Thomas de Pourquery, Léo Teruggi et Sarah Murcia ). After receiving her DEM at the Gennevilliers conservatoire where she studied with Daniel Raclot's, Sabine Balasse was accepted into "Conservatoire Royal de Musique”, Brussels, where she studied with Edmond Baert et Didier Poskin. Then she continued her studies at the Paris Conservatoire majoring in Orchestra. Although having majored in classical music, she also pursues her passion in various other musical styles such as contemporary music (Ensemble Integral), world music (Ensemble Nord Sud) and most importantly tango (Las Malenas). She took part in the Première of the tango opera Tango mon amour! by Jacobo Romano and Jorge Zulueta, staring Hanna Schygulla, in Hanover (2004-2005). She has also collaborated and toured through France with various Chanson ensembles such as DPZ (Jazz quintet), Rigolus (Rock/Funk brass orchestra) and Amayo's Fu-Arkist-Ra (Afro-beat). She is frequently invited to work with singers including Geoffroy Gobry, Valérie Mischler, Sur le sofa. She continually takes part in numerous professional recordings of various musical styles. 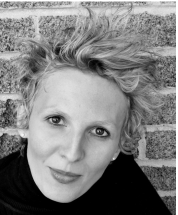 Sabine Balasse regularly performs in various theatre premier performances (Maison de Poupée by directed by Déborah Warner (1997), Les Chardons Rouges by Jean-Jacques Greneau directed by Katy Grandi (2005), Electre written and directed by Pascal Larue (2008-2010)). She is also frequently invited to collaborate in cinema projects (Toi et Moi by Julie Lopez Curval,Suzanne by Viviane Candas) and regularly works with composer Philippe Miller (Les confessions d’Odette by Yannick Vallet, Jeanne et le garçon formidable by Olivier Ducastel and Jacques Martineau, L’Age des ténèbres by Denys Arcand, Clandestin byArnaud Bedouet).